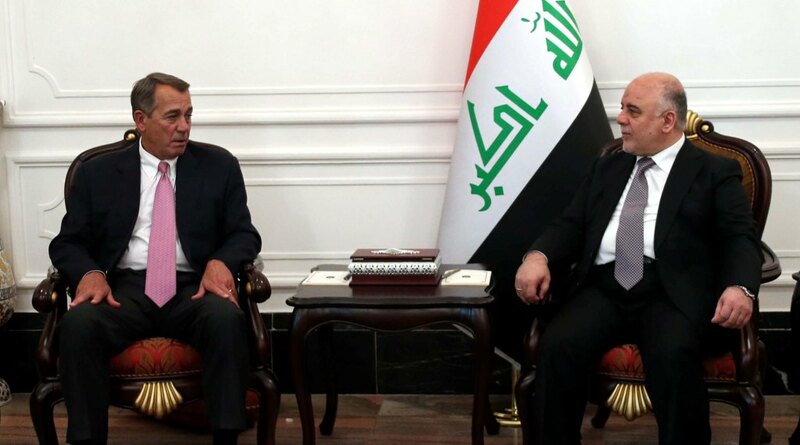 The joint Republican/Likud foreign policy roadshow today is in Baghdad; seen above House of Representatives Speaker John Boehner meeting the Iraqi Prime Minister Haider al-Abadi. The Prime Minister told Boehner that the struggle against ISIS was a national struggle of Iraq and that Hashid Shaabi popular mobilization committee is an Iraqi state institution also contributing the struggle. Boehner is unlikely to have mentioned in response that in the speech that he hailed as the best he'd heard in 25 years on the sources of threats, Bibi (R-Al Quds) had dismissed the northern Iraq battle as a "Game of Thrones" between Iran and ISIS. This narrative-jarring image shows an Islamist fighter near the top of a defaced statue of Hafez al-Assad in Idlib city, Syria. Note the nice touch of the boot on top of the statue. But of course there's no celebration in the Western media even though the image is more spontaneous than that of the Saddam-toppling in Firdos Square, Baghdad. In fact, with an Islamist coalition led by Al-Nusra Front just having taken Idlib, it's probably about time for Pentagon to suddenly remember that the Khorasan Group is there too! Remember when four hijacked planes flew into Tel Aviv? I’m glad that he was here and frankly, the speech he gave was the clearest speech I’ve heard in 25 years about the real threats that face our country. 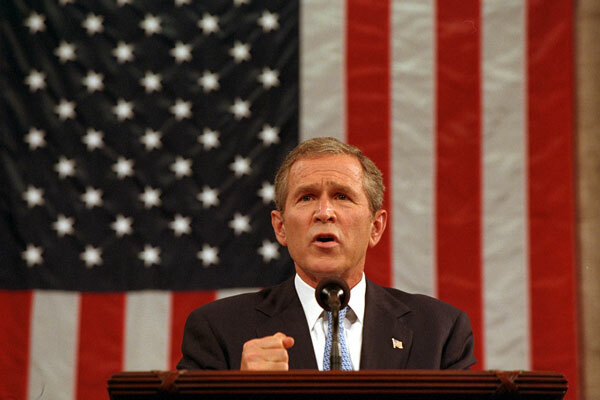 Above, George W. Bush addresses Congress on September 20, 2001. The King said the Palestinian issue is at the core of the conflict in the region, and called for intensifying international endeavors to revive peace negotiations between the Palestinians and Israelis, based on the two-state solution and the international legitimacy resolutions. Presumably we'll hear from a plain talker like Boehner on what his response was. Two unexpected allies, Pakistan and Sudan, also joined the fight. Let's take Sudan first. Sudan has always identified as an Arab country, and post-partition (with South Sudan), it clearly is. It borders the Red Sea and Port Sudan was historically a stop on the intercontinental shipping routes which had Aden has their hub. So there's not much unexpected about them taking an interest now, especially with their President just having left Riyadh. But then there's Pakistan. The NYT article correctly notes Egypt's debilitating participation in the 1960s Yemeni wars ... but not that the troops doing the bulk of the fighting for the Saudis were from .., Pakistan! Ishaan Tharoor has gathered all the history in much more detail. - the emergency means for cabin crew to access the flightdeck does not function. Procedures have been used to prevent incapacitation of all flight crew due to common factors such as food or drink poisoning. There could be other factors such as hypoxia, cabin air contamination with noxious fumes or smoke/fire, or windscreen failure (e.g. due to maintenance error or bird impact exceeding the standards provided by the airworthiness requirements. The risk of the incapacitation of all flight crew is considered to be small, but not non-existent (see Appendix 2 for more discussions on flight crew incapacitation). However, there is still a more conceivable risk where one flight crew leaves the flight deck (e.g. to go to the lavatory) and the other flight crew in the flight deck becomes incapacitated. If the emergency means to enter the flightdeck from the cabin does not have a high degree of reliability, the consequences could be catastrophic. Another conceivable risk is where one of the flight crew becomes incapacitated and the other flight crew requires assistance from the cabin crew, but the flight crew is unable to unlock the door from his station for any reason. There have been reports of pilots being locked out of the flight deck5 , with the widely publicised occurrence on a CRJ-100 on a flight from Ottawa to Winnipeg in 26 August 2006. For more Germanwings foreshadowing, or lack thereof, use your search engine of choice for the term FAR 25.772(c). UPDATE: The above discussion brings out one important point. The air regulators are now saying that the no-one alone in the flight deck rule that was already partially on the books is the response to the Germanwings case. But that rule itself emerged as a substitute for the originally proposed requirement that there be emergency access to the flightdeck from the cabin even if the door is locked. MH 370 may have met the requirement of both pilots on the flightdeck and still crashed. The issue is after realizing that the plane is under malign control, there should be a way to intervene from the cabin. The name of the Saudi military operation in Yemen does not translate very well. It's being presented variously as Determined Storm, Decisive Storm, Firm Storm, etc. Among the underlying issues revealed by attempted investigation of this issue by a non-Arabic speaker is that Google Translate still has its limitations. Here's an Al Arabiya article with associated video which explains the origin of the name in an expression of King Abdulaziz, the founder of modern Saudi Arabia. However the key phrase translates as babble, which is replicated in all other links to that story or indeed to the phrase itself. With a little more digging, it seems that the name is trying to capture the essence of a historical remark by Abdulaziz, in which he waited patiently for a dangerous situation to be resolved, and when it didn't, he stormed into action to resolve it himself. So it's Intense Action After Biding One's Time (IAABOT), which is a tad long for a stand-alone name. Still, it's probably a better name that the glory days of Operation Together Forward. UPDATE: Zach Beauchamp at Vox has collected some quotes from the last 2 days illustrating the intellectual shambles that the White House has been led to on Yemen, a country they've never understood. The President of Yemen, Abdrabbo Mansour Hadi, arriving in Riyadh and being greeted by King Salman's son Mohammed. He apparently arrived on a medical evacuation plane but looks happy enough. It's useful to have the President of the country you're about to invade on hand to vouch for your intentions! Still, amidst the endless speculation, one important area of consideration has been largely neglected — the question as to whether MH370’s captain or co-pilot had become sympathetic to Islamist extremism. It’s only now, nine days after the disappearance, that we’re beginning to seriously discuss this issue. It’s a sign of how far political correctness has encroached on our ability to think and speak about Islamist extremism. Germanwings 4U 9525 makes abundantly clear that profiling is not going to work in these type of situations. It's about the specific details of the individual in the cockpit, which is what makes so hard to understand. 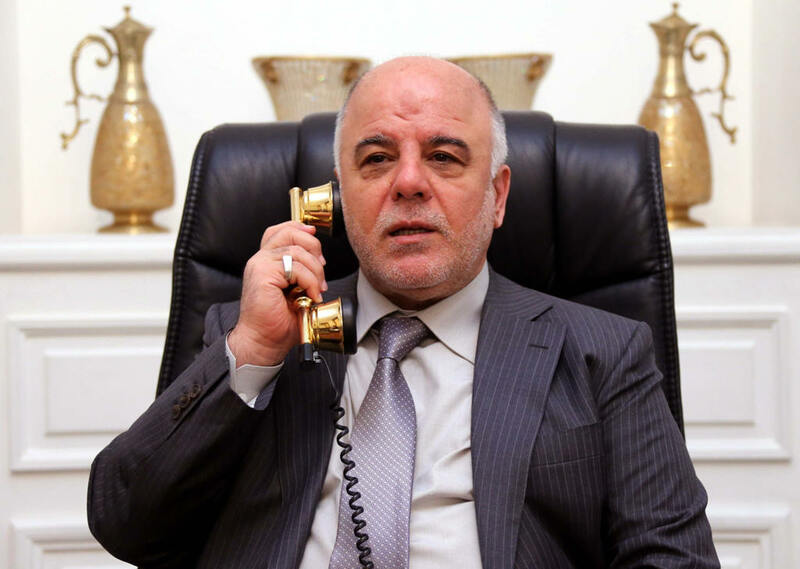 Note the elaborate gold phone being used by the Iraqi Prime Minister Haider al-Abadi to phone Iranian President Hassan Rouhani. And of major geopolitical significance, compare it to the lousy white phone he used to phone Egypt President Sisi and King Salman of Saudi Arabia! I think it [Obama-Netanyahu] clearly -- sorry, Bob [Woodward], but I think it clearly does change the overall relationship. You know, I was in Israel last year and they are stunned. They cannot comprehend why the president of the United States is obviously doing more to align American policy with Iran than with Israel. Not to pick on Judy Woodruff in particular, but the line "I was in Israel" [insert time period] is a hardy perennial of the Sunday show/pundit circuit. And of course that includes politician guests on the same shows. Any or all of the following questions should therefore be considered as follow-ups to any guest seeking validation for their views on the basis of recent trips to Israel. 1. Who paid for the trip? 2. Who arranged the meetings? 3. Were there meetings with Israeli government officials, and if so, what were the ground rules? 4. Did the visit include the West Bank in general, Ramallah in particular (to get the views of the Palestinian Authority), and other locations experiencing significant disruptions from settlements? 5. What parts of Jerusalem were visited and under what logistics? 6. How about visits to the Gaza strip? 7. What kind of Israeli government facilitation was occurring at security crossings? 8. Was any attempt made to enter Israel by a land crossing from Jordan, or vice versa? 9. How many Arabs were met in the course of the trip? Long before the USA got addicted to interventions in Iraq and indeed even before the USA was breaking its addictions to interventions to Vietnam, Saudi Arabia was already addicted to interventions in Yemen. What changes is the external counterpart/foil. In the 1960s it was Nasser. In recent years it is, allegedly and plausibly, Iran. Since the prospect of another Saudi military intervention in Yemen cannot be ruled out, the poor record of the last one, in 2009, is worth recalling. Following a border incursion by the now ubiquitous Houthis, Prince Khaled bin Sultan directed a large Saudi operation against the Houthis, in conjunction with the Yemeni army. It didn't go very well, the Saudis had hundreds of casualties and eventually withdrew with little more than a verbal promise by the Houthis not to get too close to the border again. Prince Khaled's reputation took a blow and he was subsequently eased out of his position as Deputy Minister of Defence and probably lost whatever position he had in the ultimate succession stakes. As subsequently revealed by Wikileaks, Khaled's forces did at least manage to avert a fiasco when they realized they were being tricked into a bombing a Yemeni general, Ali Mohsen al Ahmar, a rival of then President Ali Abdullah Saleh. Note that Saleh is widely considered to be a player and likely funder of the current Houthi military sweep through Yemen. One mystery is why, despite knowing Saleh's duplicity, Saudi Arabia allowed him to recuperate in Riyadh from a bomb attack on his palace -- an attack which would have turned out better for the average Yemeni had Saleh lost his life in it. One possibility is that Saleh tricked the Saudis -- again -- by saying that he would stay out of Yemen for good once he recovered. He's back, and making trouble. The bottom line at this point is that the Saudis probably see little alternative to another military intervention in Yemen, even knowing the dim prospects thereof. Maybe Benjamin Netanyahu, who's recently be claiming to the voice of the Gulf Arabs as well as Israel, has some advice for them. In the midst of the fight [Spring 2008], I received word from a very senior Iraqi official that Qassem Soleimani had given him a message for me. When I met with the senior Iraqi, he conveyed the message: "General Petraeus, you should be aware that I, Qassem Soleimani, control Iran’s policy for Iraq, Syria, Lebanon, Gaza, and Afghanistan." The point was clear: He owned the policy and the region, and I should deal with him. When my Iraqi interlocutor asked what I wanted to convey in return, I told him to tell Soleimani that he could "pound sand." When Tony Blair called George W. Bush on the day after Sept. 11 to pledge his support, the British prime minister said he assumed the U.S. was considering an immediate response. According to a report in The Sunday Age of Melbourne, Australia, giving an anonymous Blair adviser as a source, Bush replied, ''We're thinking about that,'' but he did not want to ''pound sand with millions of dollars in weapons'' to make himself feel good. As Safire explains, it seems that Bush in mind that missile strikes were not going to do it. It would have to be an invasion. That was Afghanistan, but of course the same logic -- he wasn't going to simply pound sand in Iraq either. Six years later, Petraeus was seeing the end result of that logic. And 13 years later, he's on the guest speaker circuit in Kurdistan, while Islamic Revolution Guards Command General Qassem Soleimani is helping kick ISIS out of Iraq. While presumably having avoided having an extra-marital affair with his biographer. What are your thoughts when you see Qassem Soleimani, the IRGC leader who funded and armed the militias who blew up U.S. troops and shelled the U.S. Embassy while you were in it, taking battlefield tours like you used to? Yes, "Hajji Qassem," our old friend. I have several thoughts when I see the pictures of him, but most of those thoughts probably aren't suitable for publication in a family newspaper like yours. Dude -- you had an extra-marital affair with your biographer to whom you gave classified information! But it's only your thoughts about an Iranian general that are not family friendly. And every territory that is vacated today in the Middle East is taken up by Islamist forces. So was the bad idea the US invasion of Iraq in 2003, or the American failure to stay in Iraq forever? Let me be clear: Har Homa is not, as the media attempt to insist, a ``settlement.'' It is a Jewish neighborhood in the city Israel has chosen as her capital. "I thought we had to protect the southern gateway to Jerusalem by building here [Har Homa]," Netanyahu said, with a construction site behind the podium as his backdrop. "There was huge objection, because this neighborhood is in a location which prevents the Palestinian (territorial) contiguity." Note how Har Homa -- a settlement that Bibi launched -- has gone from being pitched as an organic part of Jerusalem to acknowledgement as all along being a strategic settlement to control access to the city and prevent a contiguous Palestinian state. With much of Irish America gathered in Washington DC to hail their own brilliant Peace Process, it's not looking too good for its Arab-Israeli twin. The recommendation of this blog as a way forward against a new Bibi Unbound administration would be for the Palestinian territories and its external partners to focus very specifically on what's been happening to Jerusalem in the last two decades. Remember the benchmark here would be that the city should be run, as is sometimes proposed, under international control. But Israel's policies and demography are sending the holy city in a very different direction. Whether or not you think it's a good idea to have a US Senator (Tom Cotton) who had not even given a speech on the Senate floor before yesterday lead 47 Senators in a negotiations-busting letter to Iran is probably related to whether or not you think the sentiments expressed in his floor speech -- extracted here -- completely loony. IMF Survey: How does Iceland’s experience differ from that of other European countries that still struggle with the impact of the global financial crisis? Dohlman: Iceland has done relatively well. This year, Iceland will become the first 2008-10 crisis country in Europe to surpass its pre-crisis peak of economic output. The key differentiating factors supporting Iceland’s relatively strong recovery are worthy of further study, but rapid external adjustment through depreciation and limited government absorption of private financial sector debt were likely important factors. MARISA: You're so right. I never thought of it like that. Manure. 'Ma' and the 'newer'. Marisa laughs and George is smiling happily. MARISA: No, no. It's hard to believe anyone could be so spontaneously funny. Ireland's newest political party, Renua, came up with its name the same (Seinfeld) way. Iran’s desire to dominate the region flows from its tradition of Persian imperialism compounded by its post-1979 revolutionary zeal. 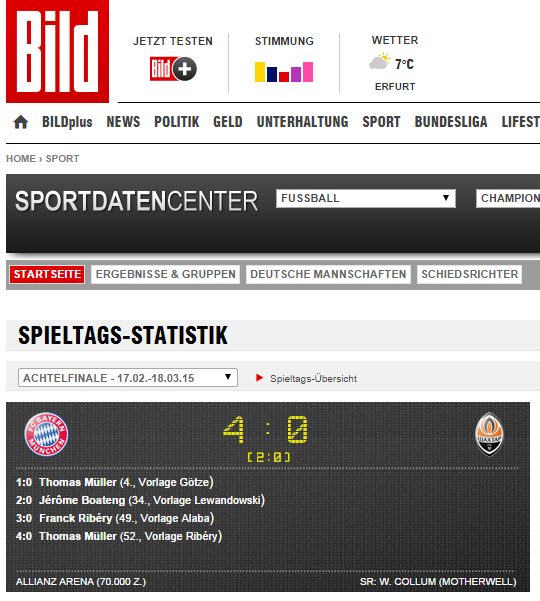 Given the current scoreline faced by Shaktar Donetsk, can't we just send in Bayern Munich to sort out the problem? It has come to our attention while observing your nuclear negotiations with our government that you may not fully understand our constitutional system. Thus, we are writing to bring to your attention two features of our Constitution—the power to make binding international agreements and the different character of federal offices—which you should seriously consider as negotiations progress. First, under our Constitution, while the president negotiates international agreements, Congress plays the significant role of ratifying them. The Medan ATC Radar has a range of 240 Nm, but for unknown reasons, did not pick up any radar return bearing SSR transponder code A2157 of MH370. The Military however admitted that they picked up MH370 earlier as it was heading towards waypoint IGARI. No other information was made available. No other information was made available because the Indonesian military had none, or didn't want to give it, or didn't want to admit what they had missed? With thousands of fighters and some parts of northeastern Nigeria under its control, Boko Haram is believed to be the largest jihadi group to pledge fidelity to the Islamic State. But terrorism experts say that the practical significance of the move announced Saturday is as yet unclear ... An American intelligence official also reacted cautiously, saying that while Boko Haram would not turn down money or material support from the Islamic State, it was unlikely that it would take orders from it. “It’s probably more for propaganda purposes than anything else,” said the official, who spoke on the condition of anonymity to discuss intelligence matters. “Despite recent Boko Haram media releases that suggest support for ISIL and the claim in Dabiq magazine, Boko Haram has not pledged allegiance to ISIL,” said James M. Kudla, a spokesman for the Defense Intelligence Agency. “Regarding video production values, although Boko Haram media production progressed during the past year, it is unclear how the new capabilities were developed.” Another American official, who spoke on the condition of anonymity to discuss confidential information, said, “The pledges and even the Twitter accounts probably do not signify a deeper connection.” He likened the actions to someone “liking” an individual or group on Facebook. Given the length of time it takes to work out these pledges, not to mention release the videos, it's unlikely that anything on the ground has changed in the last three weeks; the earlier assessment by non-US government analysts that ISIS and BH had aligned looks correct. So relative to the claim that the earlier indications were just a Like, is the on-screen pledge a selfie or a retweet? Don't be fooled. The battle between Iran and ISIS doesn't turn Iran into a friend of America. Iran and ISIS are competing for the crown of militant Islam. One calls itself the Islamic Republic. The other calls itself the Islamic State. Both want to impose a militant Islamic empire first on the region and then on the entire world. They just disagree among themselves who will be the ruler of that empire. In this deadly game of thrones, there's no place for America or for Israel, no peace for Christians, Jews or Muslims who don't share the Islamist medieval creed, no rights for women, no freedom for anyone. So when it comes to Iran and ISIS, the enemy of your enemy is your enemy. You also would never have known the same Bibi speech expressing indifference as to the outcome in Iraq that Israeli relations with the Palestinian government are disintegrating. A Sinn Féin spokesman said the party “keeps in regular communication with our supporters abroad” and that over the past 18 months had engaged in meetings with supporters from North America. “The focus of the meeting was investment, job creation and economic issues,” the spokesman said. A number of businessman had “a classic American approach to economics in that they would prefer lower taxes and lower spending on public services,” said a source with knowledge of what was discussed. “We explained we had a more European approach and believed in funding public services,” added the source, who is close to the party. Notice what the Shinners are doing. They're telling their American donors that they're just like other mainstream European political parties that prefer higher spending and taxes. But they're telling Irish voters that they're not at all like those other parties and actually reject the European centrist state completely. UPDATE: Bonus Vox tweet relevance! Is South Korean the only country where the nationalist movement is decidedly on the political left rather than the right? FOREIGN MINISTER AL-FAISAL: -- that Bashar – it’s the same, anyways – (laughter) – that they have to follow the political solution, as is suggested by the Geneva conference. El Salat del 'Id se celebrará en Granada el domingo 5 de Octubre de 2014, a las 9:30 de la mañana en la musallah del Cerro del Aceituno, in sha Allah. (Si llueve, en la Mezquita Mayor, a la misma hora). We're an ancient people. In our nearly 4,000 years of history, many have tried repeatedly to destroy the Jewish people. Tomorrow night, on the Jewish holiday of Purim, we'll read the Book of Esther. We'll read of a powerful Persian viceroy named Haman, who plotted to destroy the Jewish people some 2,500 years ago. But a courageous Jewish woman, Queen Esther, exposed the plot and gave for the Jewish people the right to defend themselves against their enemies. The plot was foiled. Our people were saved. Today the Jewish people face another attempt by yet another Persian potentate to destroy us. Korean President Park Geun-hye meets Saudi King Salman in Riyadh. She's not wearing a scarf and there's no media yelling and screaming about whether or not she wears a scarf (unlike with Nancy Pelosi and Michelle Obama) because without the media politicization of everything, the apparel sometimes does not proclaim the visiting woman. Photo credit: (the unscandalized) Saudi Press Agency. The Council of Ministers approved an agreement on cooperation in the field of mutual recognition of driving licenses between the Government of the Kingdom of Saudi Arabia and the Government of the Kingdom of Morocco, signed in the city of Marrakech on 11/05/1435 AH. A royal decree has been prepared to this effect. Among the most prominent features of this agreement: 1- A driver's license holder from one of the two countries shall be given a matching license from the other country without any theoretical or practical test provided that the license be valid in accordance with the regulations applicable in the state in which it was requested. 2- Nationals of the contracting parties - who obtained visit visas - shall be permitted to drive private vehicles, under a valid driving license issued by the competent authorities in both countries. Permission of this license shall continue until its expiry date or the end of authorized stay, whichever is earlier. Even if item 1 has a clause that could be invoked to prevent Moroccan women from taking advantage of it, doesn't item 2 mean that a Moroccan woman with a valid visa can drive a car in Saudi Arabia? The enemy of my enemy is my enemy^2? Iraq is deploying 27,000 troops to retake the city of Tikrit from Islamic State, in a mission that will test the military’s ability to stage major offensives against the group before trying to capture its stronghold in Mosul. The state-sponsored al-Iraqiyah television said that paramilitary forces, a term that usually describes Shiite militias, are backing up police and army soldiers. Qassem Suleimani, the head of Iran’s elite Quds Force, arrived two days ago to “review and advise” Iraqi field commanders, the Fars news agency reported on Monday. It's a bit odd that as the AIPAC policy conference builds up to the Bibi Netanyahu (R-IS) Congressional speech tomorrow, the Iranians would busy themselves with hands-on support to an ISIS clearance operation when Bibi is about to tell us that Iran has an apocalyptic vision in which they'd risk everything to be able to undertake a nuclear attack on Israel. UPDATE: Bibi responds! -- So when it comes to Iran and ISIS, the enemy of your enemy is your enemy.